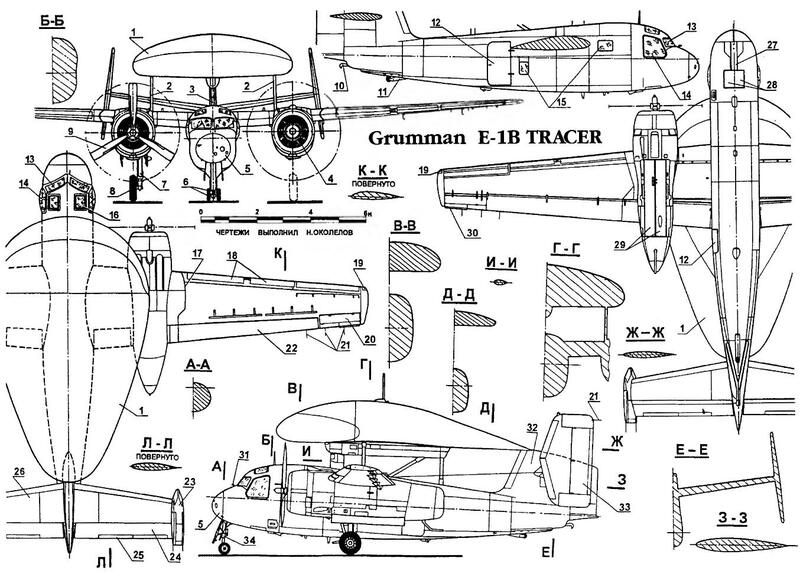 The plane of distant radar detection E-1B TRACER. The idea of installing a radar plane to detect air targets first appeared in England in early 1936. But the preference nevertheless was given to the development of a complex ground-based early warning radar. Onboard radar showed the fighter command aircraft in July 1939. The first two dozen radars have been installed on the aircraft “Blenheim”. This radar has assigned serial number MK.1, and after completion, the air force ordered about 300 of them. The antenna system consisted of a transmitting antenna in the nose of the fuselage and foster “ladder” of antennas on each wing media. Operating frequency is 200 MHz. An important parameter was the minimum distance detection. Since pointing was limited by line of sight, the fighter had to draw very close to the target, especially at night. New radar Mk.III might work for short distance detection. Then came the Mk.IV UHF, equipped with a parabolic antenna with a diameter of 725 mm for the formation of a beam width of 10 degrees, controlled in azimuth and elevation; the maximum range of the station reached up to 13 km. In the United States was considered the best radar SCR-720, which in all respects was superior to the English radar and could track a specific target automatically. In Germany also developed early warning system. In addition, the German designers have created a number of devices with which help it was possible to direct the jets of radiation locators of the British aircraft. Thus, the system “Flensburg” reacted to radar signals “Monica” protect the rear hemisphere of the bomber of the allied countries, and the complex devices “Corfu” and “Naxos” used when pointing the H2S radar signals used for radar surveying. In the Soviet Union airborne radar “Gneiss-1” is developed at the beginning of 1941 under the leadership of A. B. Slepushkina. Bring it to the installation on the aircraft failed, and the first flying prototype on-Board the station “Gneiss-2” installed on the bomber PE-2 early 1942. At the end of this year, the station “Gneiss-2” passed the baptism of fire near Moscow and was put into serial production. In the summer of 1943 in our air force created the first aviation division night interceptors with radars. Further, it became clear that radar is not able to solve the problem of dealing with a large number of targets. So, a massive attack of Japanese dive-bombers and torpedo bombers during the Pacific war, which caused a great deal of trouble for the American fleet, it was possible only because the attacking planes were approaching the target at low altitude and this allowed them to remain undetected large ship’s radar until almost the time of the attack. To solve the problem of detecting low-flying targets could only be possible by raising the radar as much as possible above the water surface. However, the large size and weight of an early warning radar for a long time did not allow them on Board carrier-based scout. 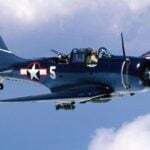 In 1945, the firm is based on the Grumman torpedo bomber AVENGER developed aircraft the TBM-3W for the detection of submarines, which is operating in the UHF range radar AN APS-20 with a mirror antenna, made in the fairing under the fuselage. In addition to surface targets — ships, submarines or retractable device — the operator on the radar screen could see and aircraft. However, the location of the fixed antenna under the fuselage significantly limits the field of view of the radar, and the allocation of low-flying targets against the background of the surface of the sea was still a problem. There was a difficulty with the classification purposes, “own” and “alien”. In addition, the patrol TVM-3W clearly did not meet the requirements of sailors. The same disadvantages were anti-submarine search. AF-2W Guardian and the AD-3W Skyraider. For long-range radar detection of air targets, they were not good. However, later, during the war in Korea, “Skyraider” performed the duties of aircraft early warning and even achieved some success. But it was a merit, rather all planes of distant radar detection and not just “Skyraider”. In the summer of 1952 a MiG-15 over the sea shot down a few British cars that were part of the current Korea’s aviation UN. This case forced the Americans to keep in the air the duty of the AD-3W Skyraider. In the afternoon of 18 November 1952, a radar operator on AD-3W was reported on the approaching ships eight unidentified aircraft. They meet up four F9F Panther, which managed to secretly get to the enemy and attack suddenly. As a result, two of the MiG-15 was shot down. Fearing the inevitable retaliation, the Americans rushed to help F9F eight fighters. But the surviving MiG-15 went into a thick cloud. The battle have demonstrated the great importance of AEW, therefore, such aircraft were required to immediately equip and Navy. But it was necessary to develop a suitable in size and weight of the radar with the necessary characteristics and electronic equipment recognition and pick up deck of the plane on which all this was established. Empty niche in defense of the American fleet in some way filled put into service the aircraft of distant radar detection (AWACS) PO-1W (WV-1) of the Lockheed company, established in 1949 on the basis of the four-civil L-1049 Constellation. Top and bottom of its fuselage housed two massive fairing large antennas of the radar. A single instance of the PO-1W was designed for flight tests. In mass production went its improved version, the WV-2 Warning Star (“star Guard”) with a crew of 26 people and a mission duration of 24 hours. “Star” was supposed to fly in the area to find a large ship connections and keep control of the whole traffic situation in a radius of 300 km. Built only 142 of these aircraft modifications. In 1962, the car was designated the EC-121. 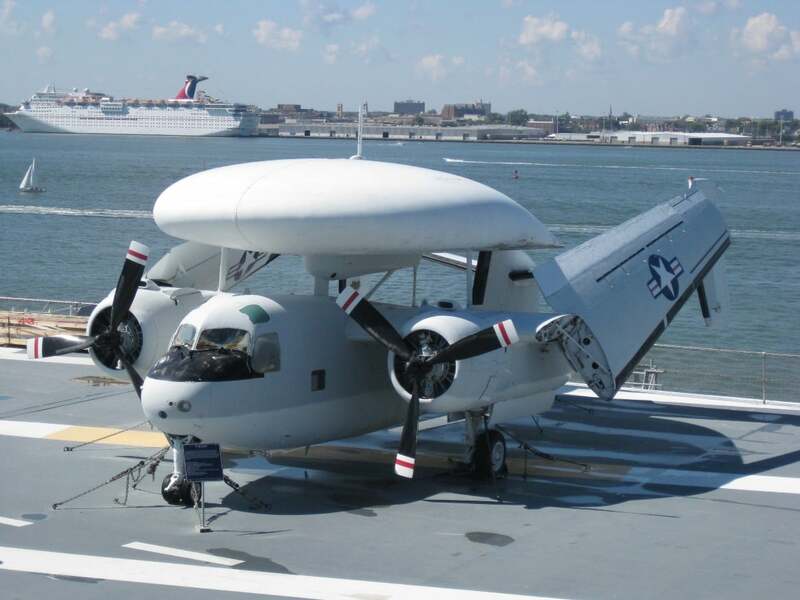 The most recent modification of the EC-121N passed aboard an aircraft carrier or on ground command post information about three hundred the air for 12 seconds. The main equipment side was the multi-function radar AN/APS-95. Its antenna is mounted inside a fixed disk-shaped Radome with a diameter of 8 m. mounted on massive pylons above the fuselage. To the ship or the control data range, the azimuth and the expected type of the target transmitted via radio relay channel using a directional antenna, which reduced the probability of intercept or of the suppression of channel noise. By the end of 70-ies of the EC-121 was the main component of air defense systems “Sege” and “NORAD”. The main drawback of the car — the attachment to its base and the inability to accompany the task force throughout its voyage. The route of flight EC-121 was formed a kind of frontier defence, which ships relied only on themselves. The use of aircraft EC-121 was allowed to warn ships and coastal objects about raids for 40-50 minutes until the appearance of the enemy. 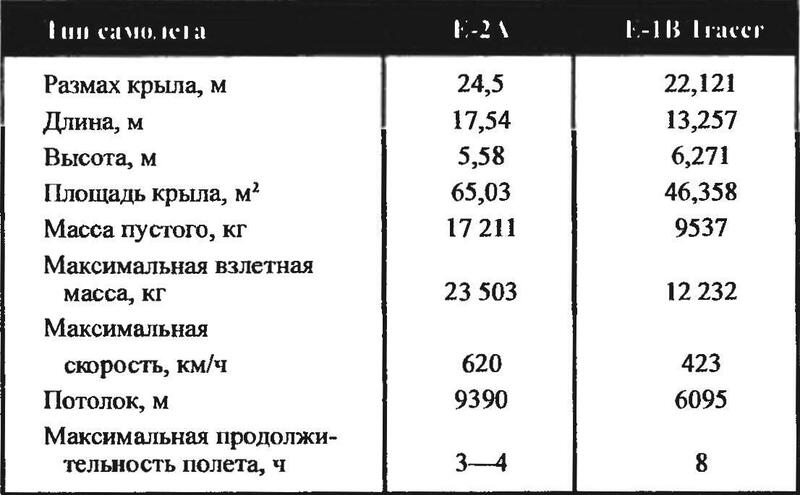 For 50 years this figure was at the border of what is permitted, for Soviet cruise missiles, the COP had a range of only 80 km and could be captured during this time. With the adoption of the same by the air force of the Soviet supersonic missiles K-10 with a range of 200 km, active radar homing, and a warhead weighing 1000 kg American air defense did not have time to react to her appearance. This situation did not suit the US Navy, they urgently needed a carrier-based AWACS aircraft, not tied to shore airfield as EU-121, and is capable of long time flying in the area the order ships. The designers of the firm Grumman’t found anything better than to offer to use for AWACS piston anti-submarine S-2F Tracker. A new version of the aircraft received the trade designation G-117. The antenna of the radar AN/APS-82 was placed in the fairing, a teardrop shape size 9,76×6,0x1,25 m, which is raised above the fuselage on the pylon with a height of one metre. It is possible to reduce the “dead zone” of the locator determined by the influence of the metallic parts of the structure. The antenna rotated inside the fairing at a speed of 6 rpm To ensure the normal directional stability empennage made two-keel, the rear of the Radome was based on remnants of the old keel. The first flight of the aerodynamic prototype for the WF-2 (as in the Navy named a new aircraft) took place on 17 December 1956. And fully equipped with radar equipment it took to the air March 1, 1957. The tests were successful, and in February the following year, standard WF-2 left the factory. The first squadron, which received new machines, steel VAW-11 in the Pacific, and VAW-12 in the Atlantic. 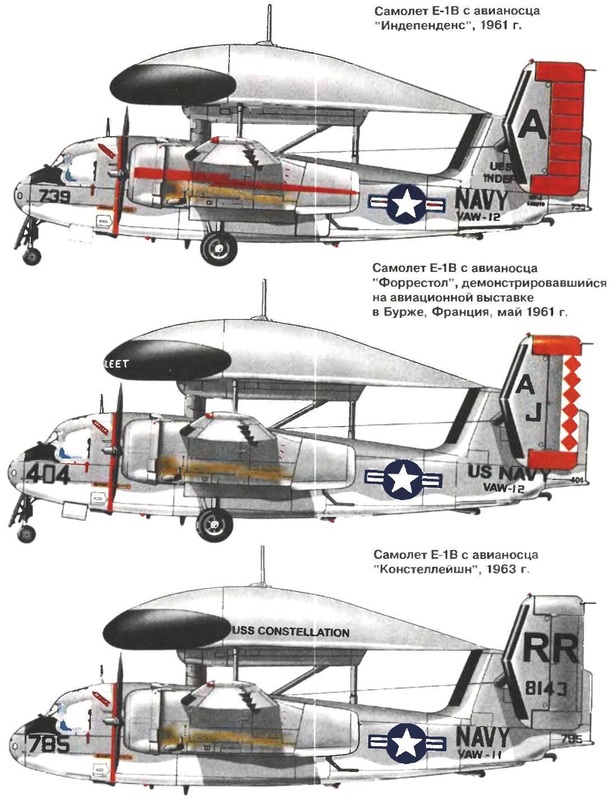 If you change the system designation of naval aircraft the WF-2 was replaced by e-1, and conferred on him the title Tracer (“Pathfinder”), mass production E-1 continued until February, 1958, were built in total 88 cars. After the adoption of the e-1, into service it became clear that the hastily created a hybrid of the plane and the locator is not justified those hopes which are assigned to it. The crew consisted only of two radar operators and pilots. The functions of command and control officer had to carry out the second pilot. Besides, the fuselage does not have enough space for the data communication equipment on the ship. Fighters at the target suggests the voice on the radio, but not directly, but through the flight control on the aircraft carrier, or the commander of the air group could lose control over what is happening in the air. The installation of more modern equipment, the expansion and the increase of the crew prevented the low capacity of the prototype. Reserves its modifications were by that time exhausted. Order to develop a new carrier-based AWACS aircraft was issued by the US Navy in 1959. The first flight of an E-2A Hawkeye (the”Hawkeye”) was held on 21 October 1959 and fully equipped machine soared 19 April 1960 (until July 1962, she had a marking W2F-1). There is a desire to fly to Montenegro? Here http://www.ally.com.ua/tours/montenegro/ you will be able to find cheap trips. A pleasant journey and stay. 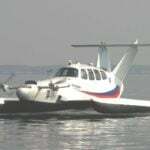 The crew of the aircraft in comparison with the “Pathfinder” had increased to five people. Thus, the co-pilot was released from duty tactical operator, and the equipment is significantly extended. On Board installed a semi-automatic instrument detection and recognition of air targets (ATDS), including new radar detection of AN/APS-70A. The information processed by the computer CP-413. Have the opportunity to use E-2A command post for guidance of interceptors for air or ground attack on the sea or ground targets. The car became known as the AWACS aircraft and management. In 1965 E-2A began to arrive on arms of aircraft carriers “kitty hawk” and “Ranger” and “Pathfinders” to lead out part of the deck units. In the mid 70-ies of the E-1 was removed from service. The last squadron equipped with them, VAW-78 and WAV 88 based in Norfolk and North island. Carrier-based early warning aircraft E-1B TRACER was a all-metal twin-engined high-wing monoplane with a two-keel tail. The crew — two pilots and two radar operator. The second pilot performed the duties of an officer of command and control. The fuselage is semi-monocoque made of aluminum. The cabin crew was located in the nose of the fuselage. Access is via a door in the starboard side. In the middle of the fuselage at the former bomb Bay housed the radar equipment and operators ‘ workstations. Over them in a teardrop-shaped fairing was mounted the rotating radar antenna. In the rear is attached to a retractable landing hook for getting caught in the ropes of the deck arresting gear. Horizontal tailplane span m 8,064 installed with a positive angle V 6.5 degrees to improve directional stability of the aircraft. Rudders large area on the fins was Horny aerodynamic compensation. The wing consisted of a center section and folding consoles. The folding mechanism is hydraulic. The internal volume of the center section was occupied by fuel tanks. The wing and stabilizer equipped with a pneumatic de-icing system. Landing gear tricycle. Basic stand (one-wheeled, pneumatic 825×216 mm) retracted into the nacelles of the engines, and the nose landing gear (two-wheeled, pneumatic 439×86 mm) — in a niche of the forward fuselage. The base chassis 4,363 m.
The aircraft was equipped with two reciprocating air-cooled engines R-1820-82WA Ciclone company Wright power 1525 HP Each engine was the size of a 1,445×1,211 m and weight of 617 lbs. all-metal three-bladed Screw with a diameter of 3,047 m.
Any weapons the aircraft is not carried.